The Genealogical Society of Broward County had its beginning in 1967 when five people attended an organizational meeting. Rapid growth began in the mid-1970's with the Bicentennial and with Alex Haley's novel ROOTS, putting emphasis on history and family history. By the late 1970's, the Society had over a hundred members and was meeting in a courtroom of the Broward County Courthouse one evening a month. In 1988 the meeting place was moved to Plantation Central Park Recreation Building and the time was changed to Sunday afternoon. In 1997, the Society had 122 members and met in the Community Room of the West Regional Library in Plantation on the first Sunday of each month at 2:30 PM. To meet the growing need for information related to using computers with genealogy, an Internet Interest Group was formed in 1994, which began meeting at 1:15 PM before the regularly scheduled meeting. 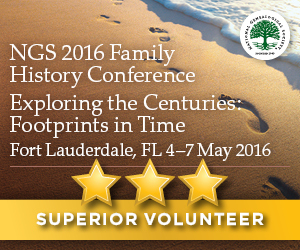 In 1977 the Genealogical Society of Broward County was chartered as a non-profit cultural organization. The Society is funded by membership dues and a restricted endowment in the form of certificates of deposit created by life memberships. The dues and interest from the certificates of deposit paid the cost of the Society's publications - the quarterly, "IMPRINTS", the monthly newsletter which was mailed to each member - and the operating expenses of the Society. Copies of "Imprints" can be found in the Genealogy Collection at NSU's Alvin Sherman Library. The main project of the Society at this time was the Genealogical Library which was maintained and staffed by member volunteers. In the early years, the Society owned a few books which were brought to each meeting in a small cart. Members could check out the books and return them at the next monthly meeting. In 1977 the Genealogical Society of Broward County members decided to establish a library. The few books owned by the Society were supplemented with member donations and books on loan. In 2006 we again had to transfer our collection. This time a permanent home was found in the special reference section of the Alvin Sherman Library of Nova Southeastern University. The books and periodicals have been cataloged and are available for use by the Society and the public.